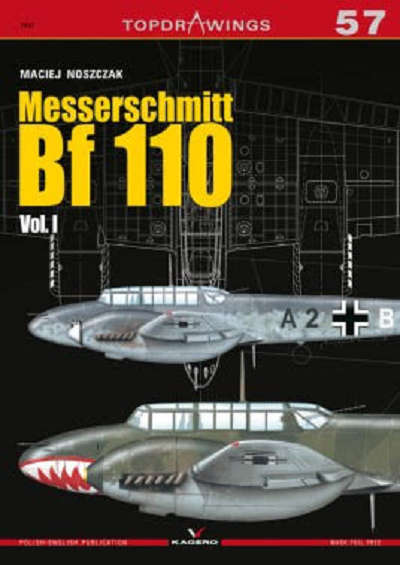 The cover art shows 2 side profiles of Bf-110's posed against a dark green background with a white line drawing showing the top of a Bf-110. One profile is of a Bf-110C-2 that is overall dark green above a light blue undercarriage. It has a shark-mouth on it's nose and a yellow tip on it's spinner. It has the fuselage code of black M8 + yellolw N black P.
It was with 6/ZG 76 and was flown by Oblt. Hans-Joachim Jabs, France, mid-May 1940. It appears in the book on page 15 again. The other Bf-110 is in a splinter of 2 greens, with grey fuselage sides over a light blue undercarriage and a white spinner. It has a black shield on the side of the nose with a white dragon and 2 pyramids on it, outlined in white. It has a fuse code of black A2 + white B black H. It is shown again on the back cover of the book. It has the black werk number 3185 on the rudder. It was with 4/JG2 (former ZG52) crewed by Lt. Hans Dietrich Albert (pilot) and Uffz. Hans Shaff (radio-operator). There are 12 color profiles (including the ones on the front and back cover) and 69 line drawings. There is a large loose sheet inserted into the book that is 27" x 19" and printed on both sides. It is folded 3 times to fit the book. The face side has a top and bottom view of a Bf-110C-1, a bottom view of a Bf-110C-1/B and illustrations of the fuselage bulkheads, all in 1/48th scale. The reverse side has a top and bottom view of a Bf-110B-1, a top and bottom view of a D-3 Trop, 2 bottom views of a D-1/R1. As a bonus, there is inserted in the book a die-cut canopy masking set designed to use on Eduard's 1/72nd scale kit of the Bf-110C/D/G. Because this was done on a black sheet the masks cannot appear in a photo...sorry! This is one neat book. It will be of great interest to aircraft historians and modelers alike. I want to thank Casemate Publishers who sent me this book sample and the folks at Kagero.